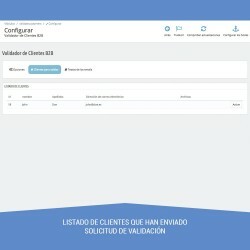 Allows you to validate new registered customers and activate B2B mode in the shop. Allows you to set the option to not show prices to unregistered visitors. 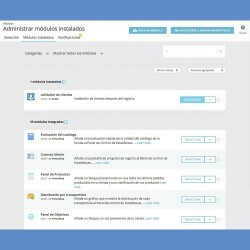 The B2B module allows you to validate new customers registering in your store to assign them to professionals group, very useful for shops who sell to professionals, and want to restrict access, or don’t want everyone to see the prices, only registered users, to control what users can see and buy. Received by the user mails customization. (validation and activation pending professional account). 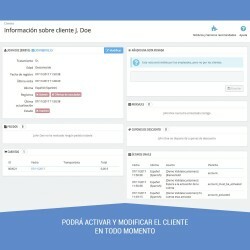 Possibility to create one or various groups of clients and move them when they register, both with normal or professional customers. 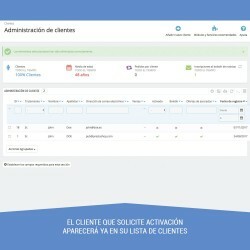 The owner has the possibility to receive register notifications every time a professional customer registers. 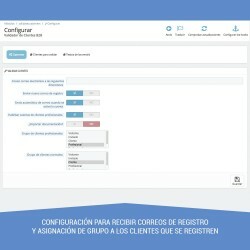 You can assign the new registered customers to one or various groups, normal users and professional users. Possibility to activate for professional users the option to send documentation in pdf, png or jpg. Notifications to the user every time a new client registers. List with validation pending customers and attached files visualization. Allows you to set the store in B2B mode, where only registered users can buy and see the prices. 08/01/2019 - v.1.3.0 Added option to make professional registring mandatory. 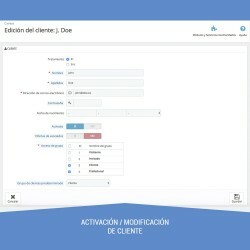 Allows you to validate new registered customers and activate B2B mode in the shop. Allows you to set the option to not show prices to unregistered visitors.